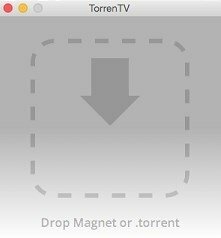 Anyone who uses Apple TV, Chromecast or Roku will find in TorrenTV a very appealing tool. One the one hand it combines the idea of programs like Popcorn Time or Cuevana Storm, that allow us to play videos by downloading torrents, and on the other, the idea of carrying out screencasts. The program is very easy-to-use, both in terms of design and functioning. You only need to drag and drop the video's magnet link or torrent onto the interface. The download will begin automatically, being able to play it on your TV after a few moments, thanks to the devices available for screencasting. No more waiting for torrents to finish downloading to be able to watch them on your TV. This program is initially conceived to play torrents, but it also allows us to play files stored locally on our computer. Therefore, it's the perfect program to make the most of both our screencast device and our TV set.